← Would it be smart if my bro. and I were added as joint owners on our mother’s home or added as joint owners with survivorship governing a passing? (Tucson, AZ) Long Realty is pleased to announce that Hilary Backlund and Jay Lotoski have joined their Oro Valley office. Hilary and Jay are a married real estate team, known as The Property Aces, who serve the Tucson, Oro Valley, and Marana areas. The couple has a combined 10 years of experience as licensed real estate professionals and are passionate about providing the highest quality of service for their clients. They are a creative and welcoming team who enjoy communicating with their clients to ensure their needs are being met. Hilary and Jay both understand the stress that comes with a real estate transaction and they are committed to making that experience as smooth and pleasant as possible. Jay Lotoski has a strong business acumen and is a licensed REALTOR®, an Accredited Buyers Representative (ABR), and earned the Short Sale and Foreclosure Resource Certification (SFR). He has also been extensively trained in the art of negotiation and will work tirelessly to get you the best deal on your home whether you are buying or selling. Jay prides himself on his superior organizational skills and detail-oriented approach. Hilary Backlund has a strong marketing background and has a passion for helping clients make home buying and selling a rewarding experience. She has earned a Graduate, REALTOR® Institute (GRI) Designation which is held by only 20% of REALTORS®. Hilary holds an e-Pro Designation for marketing through technology, an Accredited Luxury Homes Specialist Certification, and the National Organization of REALTORS® Green Designation. Hilary and Jay are well traveled and share a love for home remodeling, landscaping, and interior and exterior design. When she isn’t working, Hilary enjoys reading, adoring her pets, and volunteering at the Golden Goose. Jay is an avid golfer who loves to enjoy the Southern Arizona weather and scenery. For more information or to contact the Property Aces, email Hilary@thepropertyaces.com or Jay@thepropertyaces.com. 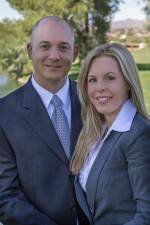 Share the post "Long Realty Welcomes Property Aces, Jay Lotoski and Hilary Backlund"
This entry was posted in Long Realty New Hires, News Clippings and tagged ABR, Accredited Buyers Representative, arizona, az, Green, GRI, Hilary Backlund, Homes for sale, Jay Lotoski, long realty, Marana, oro valley, Property Aces, Realtors, tucson. Bookmark the permalink. features should really be put into allow it to be more inviting.